Dipentene Market size is forecast to exceed USD 1.9 billion by 2024; according to a new research report by Global Market Insights. Dipentene is widely used in food & beverage industry as flavor and additive. Food grade dipentene is a biodegradable solvent which has a pleasant orange aroma and used as a flavor and fragrance additive in food products and bottled beverages. Limonene is generally recognized as safe (GRAS) to be used as a flavoring agent and is usually found in food items such as soft drinks, fruit juices, pudding, ice cream and baked goods. Rising living standards across Asia Pacific and Latin American countries is a result of increased disposable income of consumers who are gradually turning towards packaged food and drinks. Rapid urbanization and a range of other demographic changes such as ageing population and growth in supermarket retail has propelled processed/packaged food demand in these nations. Another factor which is responsible for accelerating processed food demand is the gradual liberalization of international food trade which has led to relaxation in trade tariffs and other taxes & duties. These factors altogether have contributed in this exponential growth of food & beverage industry across the globe. 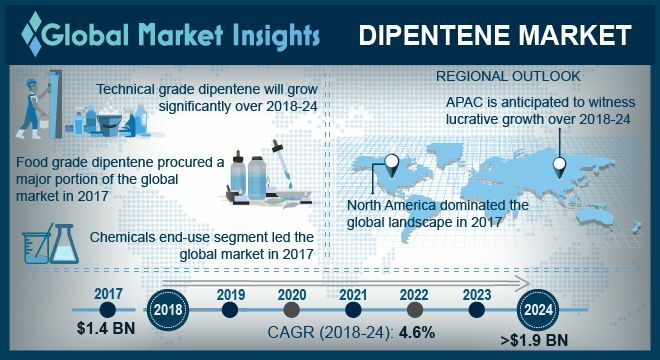 The promising growth of food & beverage industry in the coming years shall positively influence dipentene market demand across the forecast timeframe. Food grade dipentene has purity close to 99%. The product is advisable for human consumption and has numerous health benefits associated with it. It is extensively used in food products, beverages composition, personal care products & cosmetics and several drugs & medicines. All these end-users are slated to witness exponential demand in the next few years in regions including Asia Pacific and Middle East, which will ultimately fuel dipentene market demand over the forecast duration. Asia Pacific will be the fastest growing region in limonene market over the forecast timespan. It can be attributed to the rising orange production in China, which has contributed significantly to dipentene production in past few years. As per Food and Resource Economics Department, Florida, citrus fruits production in China has increased steadily reaching almost 31 million tons in 2015-16 while production in the United States and Brazil have declined in recent years. These factors shall be responsible for propelling product demand across several end-users over the forecast duration. The dipentene market is diverse and has few multi-national players and massive number of local & regional medium scale companies. The dipentene industry has market players including International Flavors & Fragrances, Inc., Mangalam Organics Limited, Mentha and Allied Pvt. Ltd., Penta International Corporation, Florachem Corporation and Florida Chemical Company. Mergers and joint ventures are prime strategies adopted by companies operating in dipentene market. For instance, in February 2018 DRT, global producer of ingredients derived from plant-based chemistry, and Mangalam Organics Ltd. entered into a supply and distribution agreement for terpene resins. The dipentene market is in its development stage and is expected to expand rapidly in the coming years. Limonene is used for commercial, domestic and industrial purposes which increases its demand and shall propel the limonene industry over the forecast timeframe. The product is used on a massive scale in paints, food flavors, perfumes and household cleaning products.